Please come celebrate, socialize and strategize if you like to talk; do yoga and dance if you like to move; at a benefit organized for Protecting Our Waters and our community by Feet Active! 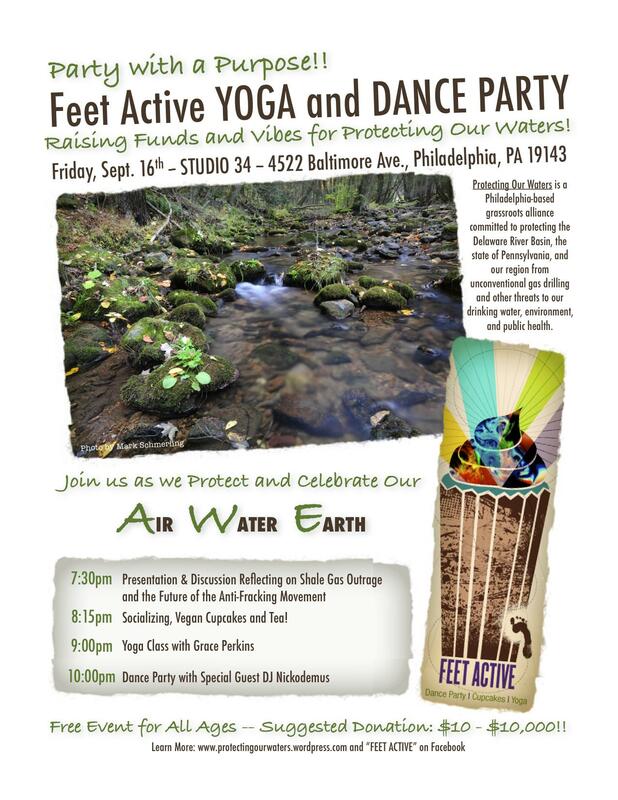 Please join us at Studio 34 (4522 Baltimore Avenue, Philadelphia PA 19143) for a celebratory fundraiser this Friday, September 16th at 7:30pm to discuss the future of the anti-fracking movement, dance, and enjoy delicious treats. “Feet Active” and Studio 34’s “Party With a Purpose” have joined forces to benefit POW with a fun-filled all-ages evening of activities. If you don’t like yoga/don’t dance, don’t worry! There is room for all to gather, talk, connect, plan, and just enjoy each other’s company. 8:15pm – Socializing, Vegan Cupcakes and Tea! Suggested donation at the door is $10 – $100. Your donation helps us keep educating, reaching out, building and organizing. We will also have 40 copies of Sandra Steingraber’s book, Raising Elijah, available at the event. Come for just one activity or stay for the whole evening — we can’t wait to see you there! Thanks for everyone’s support and special thanks to Feet Active and to Studio 34 for your initiative, generosity and wonderful work on this event!